WSCH201P Seat Belt in HOT PINK includes a removable plastic sleeve to keep your buckle easily accessible at the side of your seat. If needed the 12" plastic sleeve can be removed for installations through a bench seat. Push Button 3-Point Inertia-Locking Retractable seat belt features heavy duty plastic buckle housing and metal internals. Retractor stores webbing when not in use. Seat belt mounts on either driver or passenger side of your vehicle. Please Note: This is a universal fit seat belt, but it will not fit every vehicle. It is important to measure your vehicle for proper fit before you purchase a replacement seat belt. View our measuring guide for help. The adjustable lap and shoulder webbing is 133 inches total length and is adjustable down. The buckle side is 12 inches in length. Seat belt clip slides up/down webbing for adjustment. Clip measures roughly 2 1/2" long X 2 1/2". 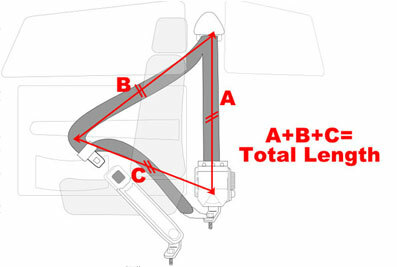 Quantity: Each Seat Belt is sold individually, and mounts on either driver or passenger side. Belts are proudly ASSEMBLED, SEWN AND FINISHED IN THE USA. Retractor MUST mount in a upright position. 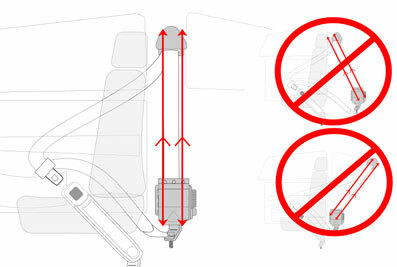 Our Seat Belt Retracting Mechanism MUST mount vertically. A tilting retractor will not function properly and can result in serious injury or death. Retractor must mount either on floor (mount upright with"L" Bracket) or can be mounted on door pillar if mount already exist. Do not mount retractor on ceiling, body quarter panels, inside seats, attached behind seat, or feeding through seats. Retractor and Shoulder loop must be vertically aligned. Webbing Retractor must be mounted beneath shoulder loop. If there is no pre-existing mount available you will be required to drill one. If this is not something you are comfortable doing please consult a professional mechanic for installation or your car's dealership for an original replacement seat belt. Shoulder Loop must be mounted upright. Make sure there are no twist or bends in the webbing between the retractor and shoulder loop. Measure the length of your seatbelt. 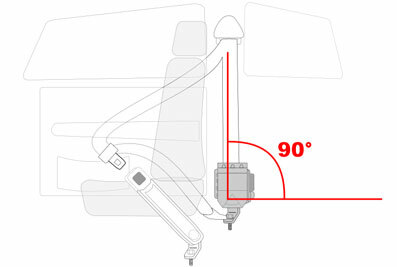 Measure your seat belt and compare length before placing an order. Start at the retractor, go up through the shoulder loop, then go over your shoulder to the buckle and then back to the retractor. We list the maximum extended length of our belts for your reference. If you require a longer seat belt we may be able to accommodate your request. Call for details. 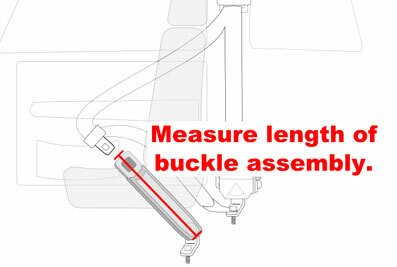 Measure the length of your buckle assembly. Buckles come in different lengths. Measure your buckle/receiver before placing an order. We sell various buckle lengths. You must match the buckle length you need to the seat belt you purchase. Buckles supported by rigid plastic sleeves can remove sleeves if installing buckles sandwiched between a bench seat.